What Is a Degausser and How Does It Work? A degausser is a machine that disrupts and eliminates magnetic fields stored on tapes and disk media, removing data from devices like your hard drives. The degaussing process changes the magnetic domain where data is stored, and this shift in domain makes data unreadable and unable to be recovered. Degaussers work on hard drives in most of today’s devices, VHS tapes, cassettes, LTO and DLT tapes, and other storage devices. However, they do not work on compact disks and other optical storage elements. Degaussing represents one of the best steps to take before destroying or shredding hard drives, by giving you an extra layer of protection against someone accessing your information illegally. A degausser generates a controlled magnetic field that it uses to remove information. Your equipment all has an Oe rating that lets us know how strong of a degausser is needed to remove the information on that storage medium. The typical hard drive uses a circular flat piece of metal with an iron oxide or chromium dioxide coating to create and store information. Electrical pulses move through a coil in the head of the hard drive to magnetize part of the metal and position the coating to store information in binary. Degaussers generate magnetic fields that disrupt the coating and removes the magnetic memory from it. This ends up completely randomizing the data pattern that exists so none of the information is the same. Many of the devices that we can put through a degausser are still able to be used afterward. Generic magnetic storage devices like reel-to-reel tapes and VHS video cassettes are the most likely to be usable after degaussing. The downside is that these are so old that you generally won’t save any money by trying to reuse them due to the upkeep of older equipment and their limited storage. Today’s hard drives in your servers, computers, laptops, and tablets, plus many backup tapes, are rendered unusable by the degaussing process. The shift in the magnetic domain is permanent and does irreparable damage, which is perfect if you’re looking to delete information for good. If you’re looking at all degaussing service, there are a few things you’ll want to learn and understand. Here are a couple of the biggies. Oersted (Oe) is the measurement of a magnetic field in a vacuum. You’ll find Oe ratings of about 1800 or higher for current tapes, while hard drives can easily reach 5,000 Oe. These energy level ratings tell you how strong of a degausser you’ll need to destroy the data that’s being stored on the device. You’ll see coercivity used interchangeably with Oersted in many instances, because coercivity is the among of magnetic field that must be applied to reduce a magnetic induction to zero (which kills data on hard drives). Essentially this is a rating of how easy or difficult it will be to demagnetize your magnetic media. If you see both used together, just remember this: the higher of either term, the stronger the degausser you’ll need to make sure your information is gone. It’s time to ask the big question: should you use degaussing from a service like Securis when getting rid of your old equipment? We always like to say “Yes!” when it’s data that contains any personal information, credit cards, or anything else that could be used to harm your business, customers, or reputation. There are a few times where you must use degaussing too. 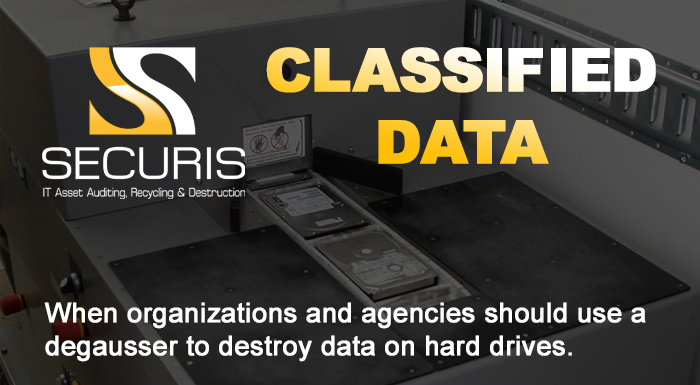 If you’re using any information that requires a clearance level, such as “Classified” or “Top Secret” designations, you must follow disposal standards and procedures that include degaussing. Degaussing also is always recommended for HR companies, financial firms, companies with proprietary information, and anyone who stores health or personal customer information. It is the best way to secure your data and then follow up with a full hard drive shredding just to be safe.